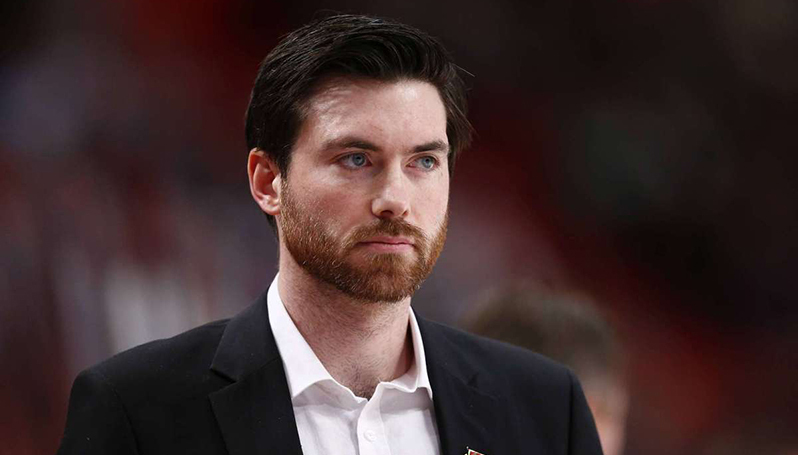 Chicago, Ill. - The Chicago Blackhawks announced today that they have hired Jeremy Colliton (KAWL-ih-tuhn) to serve as head coach of the organization’s top minor league affiliate, the American Hockey League’s Rockford IceHogs. "Jeremy’s experience as a player and a coach will allow him to be a great leader and mentor for our young prospects in Rockford," said Senior Vice President and General Manager Stan Bowman. "He is coming off a great start to his coaching career with four successful seasons in Sweden and fits very well into our plan of continuing to develop our younger players." Colliton spent the last four seasons as the head coach of Mora IK in Sweden (HockeyAllsvenskan). A native of Blackie, Alberta, Colliton guided his team to a league-best 35-4-13 record and 105 points during the 2016-17 season. Following the regular season, he led Mora IK to a promotion to the Swedish Hockey League for the 2017-18 season after defeating Leksands IF in six games (4-2) of the best-of-seven series. Colliton joined the coaching ranks with Mora IK in an interim head coaching role during the 2013-14 season before taking over full-time the following season. In four seasons with Colliton behind the bench, Mora IK posted a 98-18-57 record. Prior to becoming a coach, Colliton had an eight-year professional career primarily in the National Hockey League and AHL. He appeared in 57 NHL games across five seasons (2005-09, 2010-11) with the New York Islanders, notching three goals and three assists. He was originally drafted by the Islanders in the second round (58th overall) of the 2003 NHL Draft. The 32-year-old also spent parts of six seasons (2005-09, 2010-12) in the AHL with the Bridgeport Sound Tigers, recording 203 points (77G, 126A) in 326 career games. Additionally, he had stints with Rogle Angelholm (2009-10) in the Swedish Elite League and Mora IK (2013-14). He also had experience on the international stage, earning gold and silver medals while representing Canada at the 2005 and 2004 IIHF World U20 Junior Championships, respectively. Colliton is the fourth Head Coach in Rockford’s AHL history, and 10th overall as the team enters its 19th season. Other coaches in the team’s AHL era include Ted Dent (11-17), Bill Peters (08-11), and Mike Haviland (07-08). Colliton is just the third Head Coach in the history of the IceHogs to bring NHL playing experience behind the bench, and first in the team’s AHL era. Dale DeGray, who coached Rockford from 1999-01, played in 153 NHL contests with Calgary, Toronto, Los Angeles and Buffalo. Steve Martinson, who was the club’s bench boss from 2004-07, appeared in 49 NHL games with Detroit, Montreal, and Minnesota.